Salari, D., Niaei, A., Hosseini, S., Aleshzadeh, R., Afshary, H. (2010). Investigation of the Activity of Nano Structure Mn/γ-Al2O3 Catalyst for Combustion of 2-Propanol. International Journal of Nanoscience and Nanotechnology, 6(1), 23-30. D. Salari; A. Niaei; S. A. Hosseini; R. Aleshzadeh; H. Afshary. "Investigation of the Activity of Nano Structure Mn/γ-Al2O3 Catalyst for Combustion of 2-Propanol". International Journal of Nanoscience and Nanotechnology, 6, 1, 2010, 23-30. Salari, D., Niaei, A., Hosseini, S., Aleshzadeh, R., Afshary, H. (2010). 'Investigation of the Activity of Nano Structure Mn/γ-Al2O3 Catalyst for Combustion of 2-Propanol', International Journal of Nanoscience and Nanotechnology, 6(1), pp. 23-30. Salari, D., Niaei, A., Hosseini, S., Aleshzadeh, R., Afshary, H. Investigation of the Activity of Nano Structure Mn/γ-Al2O3 Catalyst for Combustion of 2-Propanol. 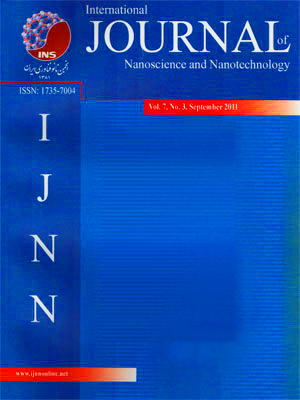 International Journal of Nanoscience and Nanotechnology, 2010; 6(1): 23-30. This paper reports results of a study regarding the activities of nano structure Mn/γ-Al2O3 and γ-Al2O3 catalysts for oxidation of 2-propanol (as a model of volatile organic compound). Nanostructure of catalysts was revealed using XRD, SEM and TEM techniques. Catalytic studies were carried out in U-shaped packed bed reactor under atmospheric pressure and at the reaction temperature of 150- 500°C. Results showed that the introducing of manganese onto γ-Al2O3 improves the activity of Mn/γ-Al2O3 compared to pure γ-Al2O3 for oxidation of 2-propanol. This study confirms that nanostructure Mn/γ-Al2O3 catalysts can be suitable for oxidation of organic compounds. This study, hopefully, holds the promise for the eliminating of 2-propanol contained hazardous materials in industrial application.